Let’s all say it together now – hello spring produce! 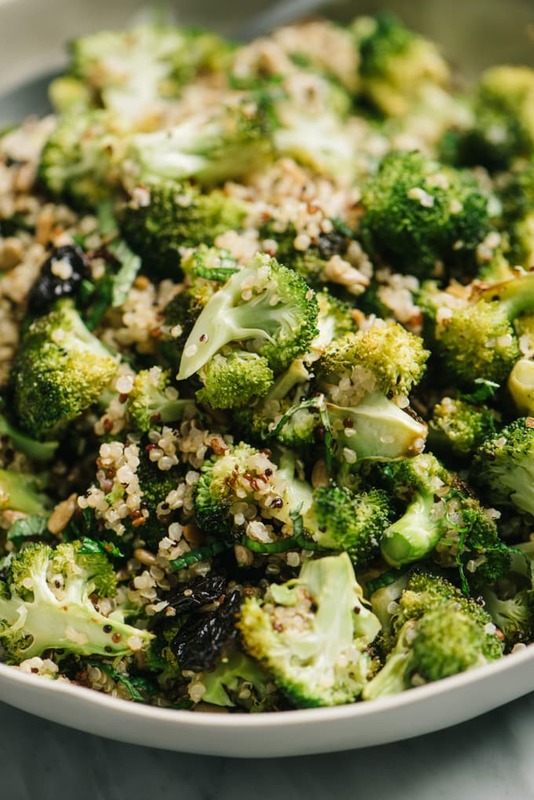 Let’s all scream it together now – hello roasted broccoli quinoa salad! Yes, I am screaming about this delightful vegan salad because it’s just that darn good. Sweet, tart, crunchy and filling, this roasted broccoli salad is plant-based perfection. Getting more veggies in has never been tastier! >>> Pin it now! 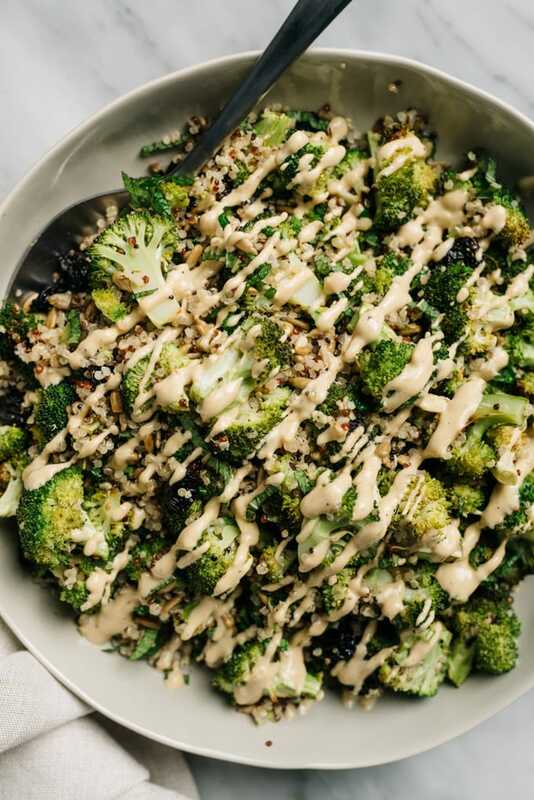 Click here to save this Broccoli Quinoa Salad to your Vegan Recipes board on Pinterest! Oh hello spring. You have been so eagerly anticipated with your delicious green vegetables, juicy berries, and fresh herbs. I cannot wait to nosh. you. up. Can you tell I’ve been dying for warm days and cool nights, the arrival of baseball season, and all of the produce? 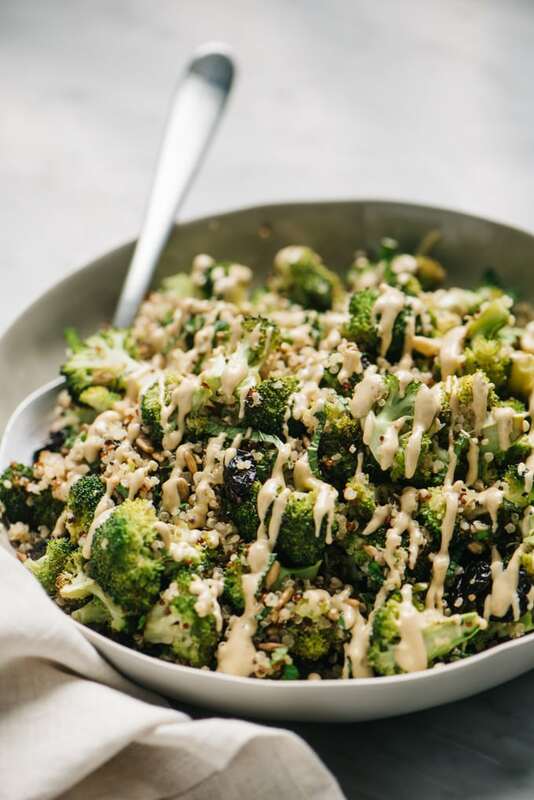 This roasted broccoli quinoa salad is my opening toast to the spring season, which really truly arrived in western Maryland this past weekend. I’m looking at a solid week of temps in the 60’s and 70’s, and my garden gloves are trilling their siren call. I’m beyond ready for this season of new beginnings. Roasted broccoli salad with sweet things and crunchy things and the very best dressing ever is exactly what I needed to kick off the season on the right…foot? Erm…fork. Yeah, that’s better. 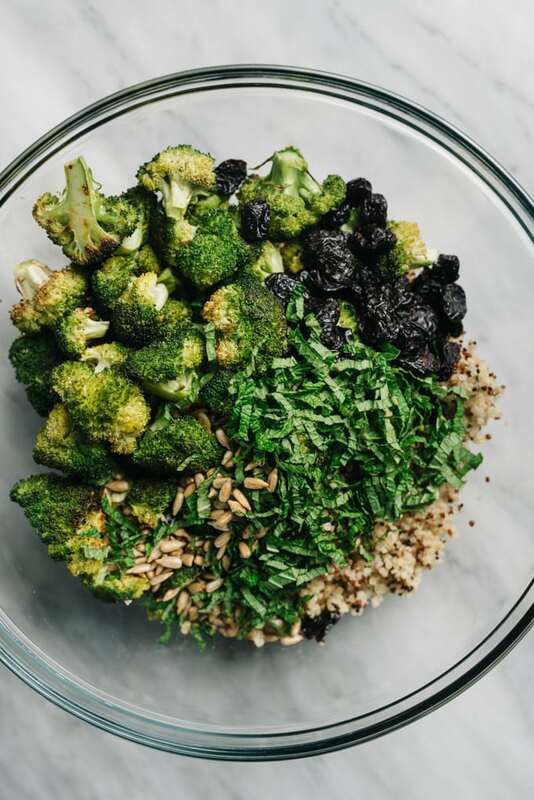 Sweet and tender roasted broccoli, perfectly fluffy quinoa, tart dried cherries, nutty roasted sunflower seeds, and refreshing mint come together in the most delightfully balanced flavor explosion. This tasty hot(ish) mess get topped with my favorite sunbutter dressing for a vegan salad that will have you actually believing you can rock a plant-based lifestyle if you really wanted to. Seriously carnivores, it’s that good. 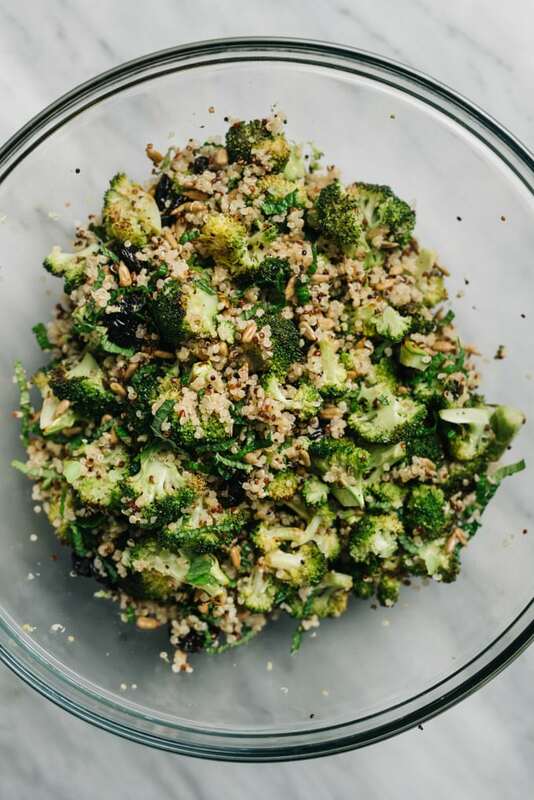 In just thirty minutes you can become the envy of the block or the lunch table with this delightfully delicious roasted broccoli quinoa salad. It’s perfectly balanced with sweet, nutty, and tart and will elevate your lunch status to Level 10 Tasty with just a handful of seasonal whole foods. You seriously won’t believe it’s vegan! Move over chicken salad – there’s a new kid in town. Perfect oven roasted broccoli is the star of this salad. Properly prepared, it’s crunchy, sweet, and totally addictive. Start by cutting the broccoli into bite-sized florets of uniform size so they roast at the same rate. Rinse the heads of broccoli under cool running water, then shake to remove any excess water. Pluck any leaves from the stems, then trim the stems from the heads, and reserve for another purpose. Place the trimmed broccoli head upside down on the cutting board. Using a paring knife, slice whole florets from the stalk. Cut larger florets through the stalk, then gently pull apart to create bite-sized pieces. 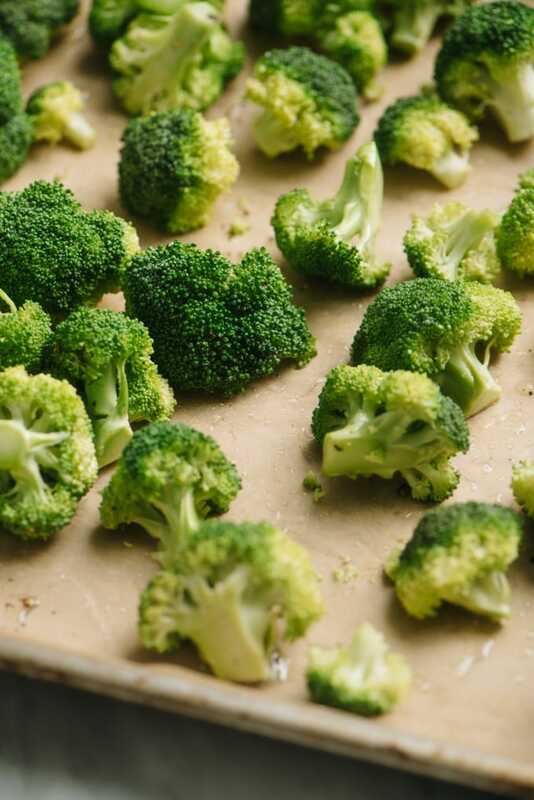 Spread the broccoli florets onto a parchment lined baking sheet. Drizzle with olive oil, then sprinkle with salt and pepper. Toss the broccoli with the oil and seasoning using your clean hands, then distribute the florets evenly across the baking sheet. Roast for 20 minutes in a 425°F oven. For maximum crispiness, flip the florets once halfway through. Place the quinoa into a fine mesh sieve. Rinse the quinoa under cool running water until the water stops foaming (this sounds weird, but you’ll see what I mean). The rinsing step removes the quinoa’s natural coating (saponin), which can cause the cooked quinoa to clump, and can also make it taste bitter. 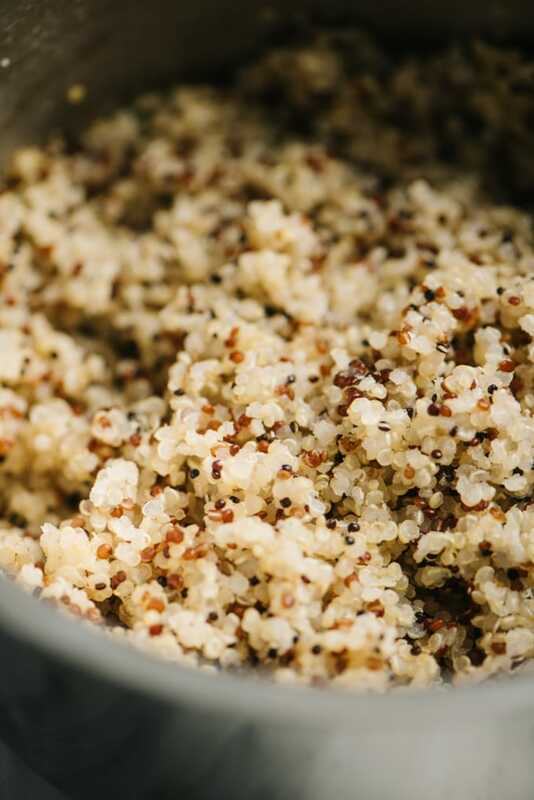 Combine the rinsed quinoa with water – one part quinoa to two parts water – plus a pinch of salt. Heat the water and quinoa over high heat until the water starts to boil, then reduce the heat to low to maintain a slow simmer, cover, and cook for 15 minutes. After 15 minutes, check the quinoa to make sure all of the water is absorbed. Cook a minute or two longer if it’s not. Then remove from heat, and keep covered for an additional 5 minutes. Remove the lid and fluff with fork. Perfect! Hard part’s done, and we’re at the finish line! Combine the cooked quinoa and roasted broccoli in a large mixing bowl. Add dried cherries, roasted and salted sunflower seeds, and some chopped fresh mint. I really happen to love the combo as written, but you be you (or clean out your pantry as needed!). Toss it up, and then get your sauce game ready. 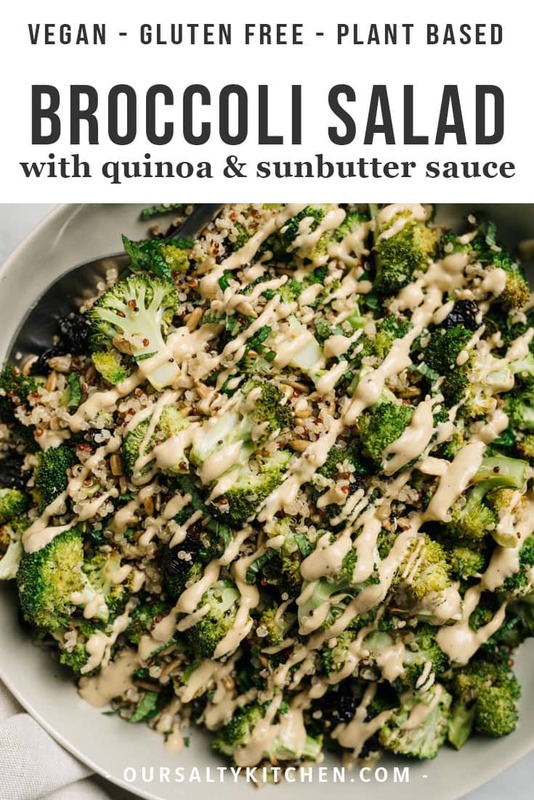 Using a food processor or the smoothie attachment on a blender, whip up some sunbutter sauce – it’s tangy and nutty, and the perfect compliment to roasted broccoli. You can find the recipe for sunbutter sauce here. Sauce it baby! Drizzle the sauce over the salad, and then dive right in. I had this for lunch as-is, and it was perfectly filling without any additions thanks to healthy dose of fiber. This is a vegan salad situation I fully endorse. How long does this salad last? Quite awhile! Store this salad in a tightly sealed container in the fridge for up to five days. It’s best stored separate from the dressing. It’s pretty tasty cold, or reheat in the microwave for 30-60 seconds if you’d like. I don’t want to make sunbutter sauce. Is there another dressing you recommend? Sure! It’s also great with a light lemon dressing. Find my favorite lemon vinaigrette recipe here. Can I add cheese? Of course! Shaved parmesan, feta, or ricotta salata would all be excellent additions. About a quarter cup should do it. Is this a good recipe for meal prep or for a picnic or potluck? Absolutely! Portion the salad and dressing separately into meal prep bowls (or two larger containers), then combine once you’re ready to eat. It’s equally delicious served warm, room temperature, or cold. 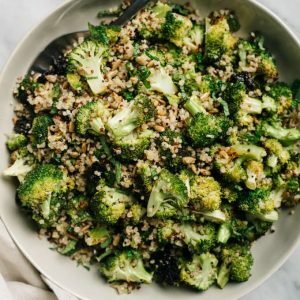 DID YOU MAKE THIS BROCCOLI QUINOA SALAD? I WANT TO SEE YOUR CREATIONS! SNAP A PICTURE AND SHARE IT HERE ON PINTEREST. 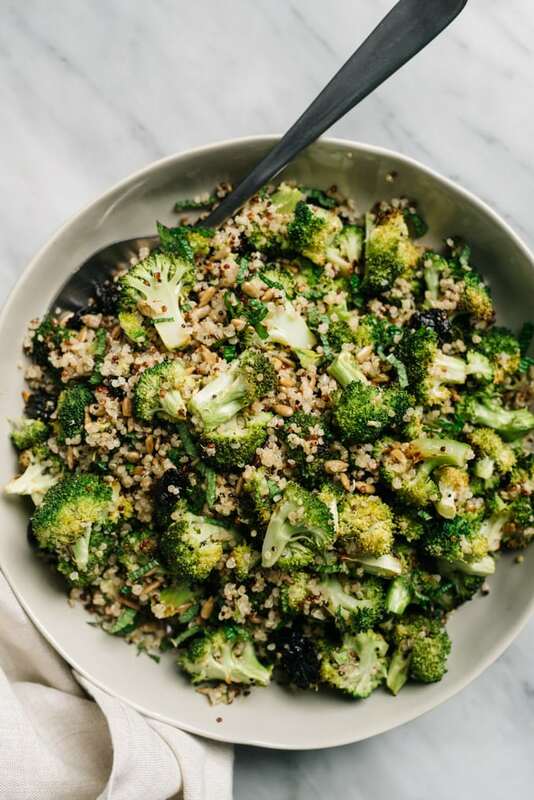 In just thirty minutes you can become the envy of the block or the lunch table with this delightfully delicious roasted broccoli quinoa salad. It's perfectly balanced with sweet, nutty, and tart and will elevate your lunch status to Level 10 Tasty with just a handful of seasonal whole foods. You seriously won't believe it's vegan! Heat the oven to 425°F. Line a baking sheet with parchment paper. 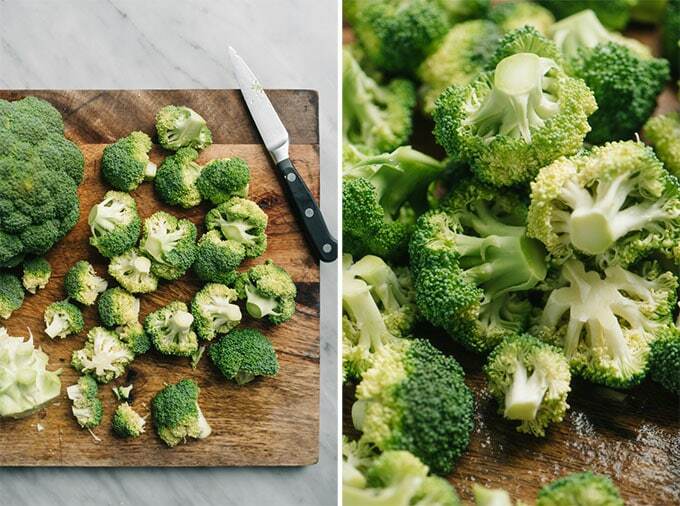 Prep the broccoli. Rinse the broccoli then trim stem and reserve for another purpose. Using a paring knife, slice the florets from the head. Slice any larger florets into bite-sized pieces, aiming for uniformly sized pieces that will roast evenly. Roast the broccoli. 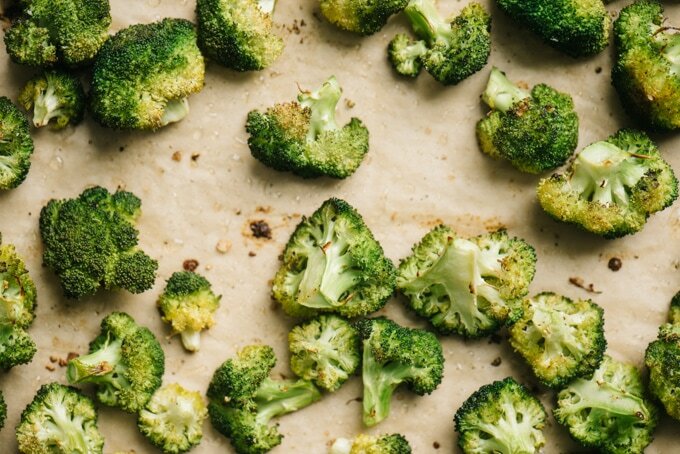 Place the broccoli onto the prepared baking sheet. Drizzle with the olive oil, salt, and pepper, then toss with your clean hands to distribute the oil and seasoning. Transfer the baking sheet to the oven and roast for 20 minutes, flipping once halfway through. Make the quinoa. 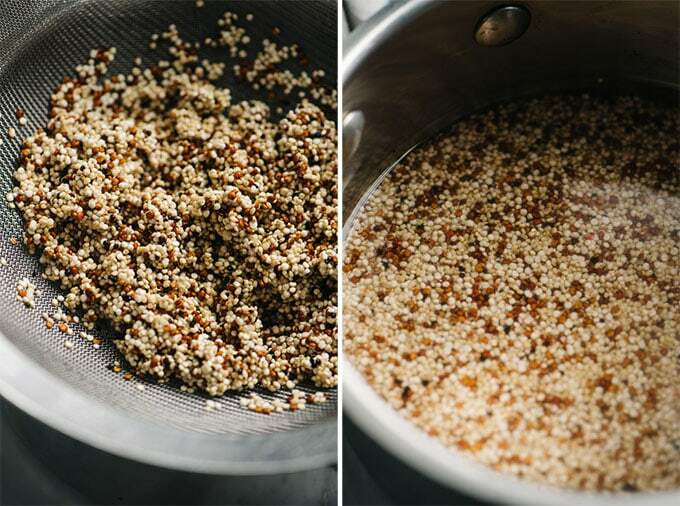 Place the quinoa into a fine mesh sieve, then rinse under cool running water until the foam subsides. Combine the rinsed quinoa with the water or broth in a small sauce pot. Bring the liquid to a boil over high head, then reduce to low, cover, and cook 15 minutes. Remove the pot from heat, and allow the quinoa to sit an additional 5 minutes. Remove the lid and fluff with a fork. Make the sunbutter sauce. Combine all ingredients in a food processor. Process until the sauce is smooth and the garlic has been pulverized and worked into the sauce. If the sauce is too thick, add more water a teaspoon at a time until it reaches the consistency of ranch dressing. Combine the roasted broccoli and cooked quinoa in a large mixing bowl. Add the sunflower seeds, dried cherries, and mint. Toss with the sunbutter sauce and serve immediately. Alternatively, pack the salad and dressing into separate containers. Refrigerate until ready to eat. Reheat for 30-60 seconds in the microwave, pour the sauce over the salad, and enjoy. This salad keeps for up to 5 days in a tightly sealed container in the fridge. Best stored long-term with dressing on the side.